Poached Garlic Soup is a definite ten rating! Your guests will never believe how much garlic there is in this soup. After the garlic has been cooked slowly, it loses its harsh rawness and becomes delicate and refined. It is hard to say exactly how or at what stage this happens – it is one of those mysteries which makes cooking so fascinating! This will become one of your favorite soup recipes. I have served this outstanding Poached Garlic Soup with many of my Dinner Party Menus. Please check out my Veal Scaloppine Piccata dinner menu, Lamb Roast with Port Wine Sauce dinner menu, and Truffle Dinner which includes this wonderful Poached Garlic Soup. * When selecting garlic, it should be big, plump and firm, tight silky skins with its paper-like covering intact, not spongy, soft, or shriveled. Also remember that a single bulb of garlic usually contains between ten and twenty individual cloves of garlic. The individual cloves are covered with a fine pinkish/purple skin, and the head of cloves is then covered with white papery outer skin. In a medium saucepan over medium-high heat, combine garlic cloves and 3 cups of vegetable or chicken broth; bring to a boil and poach 15 minutes or until soft. Remove garlic cloves to a small bowl and mash with a fork; set aside for use in make Toasted Garlic-Butter Bread. Cook and reduce chicken broth to a glaze; remove from heat and set aside. Note: Glazes are concentrated reductions of stock that can be used to fortify sauces. Prepare Toasted Garlic-Butter Bread; cover with plastic wrap until ready to serve. In a large soup pot over low heat, melt butter. Add onion and saute until soft. Drain the water from the potatoes; stir the potatoes into the butter and onion mixture. Season with salt and pepper. Add remaining 4 cups vegetable or chicken broth. Increase heat to medium-high; simmer, uncovered, 25 minutes or until the potatoes are softened. Remove from heat and let cool 10 to 15 minutes. In a food processor or blender, puree soup; return to soup pot. Add garlic glaze; stir until well blended. The soup can be made 1 to 2 days in advance up until this stage. Refrigerate until ready to finish. When ready to serve: Stir in heavy cream, milk, salt, and pepper; cook, over low heat, another 10 minutes. Remove from heat. Serve in soup bowls and garnish with parmesan cheese. Serve with Toasted Garlic-Butter Bread. In a small bowl, combine butter and mashed garlic cloves; mash until well blended. Spread garlic mixture evenly over the top of the bread slices. When ready to serve, broil bread for a few seconds or until top is lightly browned and bubbly. 1. You may use any type of potatoes that you want or are available when making this soup. 2. A reduction is the result of boiling or cooking down a liquid until it reduces to the consistency of a sauce. If you are looking for a cup of sauce, start with two cups of stock. Basically you are going to reduce whatever liquid you are using in half. If you think the sauce should be thicker, continue cooking it down until it reaches your desired consistency. 3. 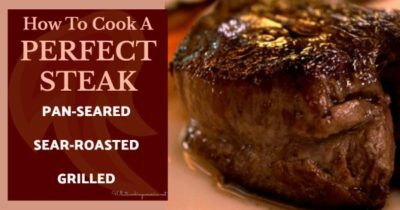 A glaze happens when reduce braising liquid and pan drippings into a thick, spoon-coating sauce. A reduced-liquid glaze can be as thin or as thick as you want it to be, according to how long you cook it. Pay attention when making a reduction, because a glaze can burn if you boil it down too fast or too far.